Maximize job site productivity with the new RIDGID® RE 60-MLR Manual Hydraulic Crimp Tool when crimping color coded lugs and splices up to 600 kcmil (MCM) copper and 350 kcmil (MCM) aluminum. Featuring a lightweight, compact and ergonomic design, the RE 60-MLR includes the RIDGID RapidAdvance™ technology. The proprietary technology only requires one pump to engage the lug and reduces the total number of pumps needed to complete the connection. The low handle force reduces hand strain and operator fatigue and a built-in pressure relief valve also indicates when maximum force is reached and crimping is complete. These features allow for more quality crimps in less time. The RE 60-MLR’s 330-degree head rotation, combined with a slim latching crimp head-design, provides maximum tool access in even the most confined panel spaces. The manual hydraulic operation makes the tool ideal for use in remote locations where access to power is limited. “Electricians will appreciate how the RIDGID RE 60-MLR maximizes productivity thanks to its RapidAdvance technology and compact design while also being comfortable and easy to use all day,” said Gina Hartman, RIDGID Global Marketing Manager. 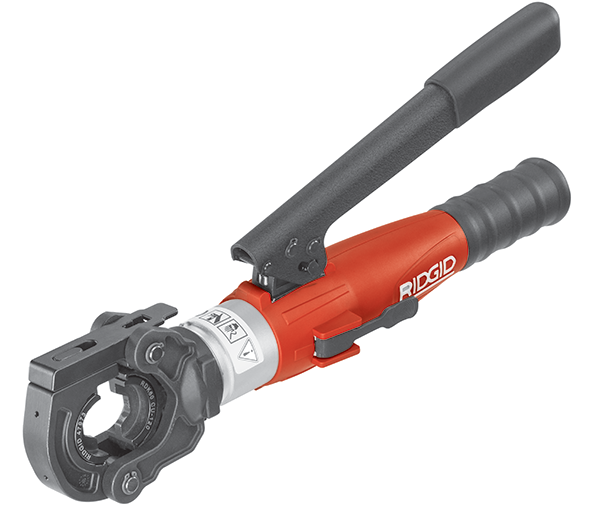 The RE 60-MLR joins the RIDGID RE 12-M Manual Hydraulic Crimp Tool, the world’s lightest and easiest-to-use 12-ton manual hydraulic crimp tool. For additional information about the RE 60-MLR and full line of RIDGID electrical products, please visit RIDGID.com or call toll-free: 1-800-769-7743. Also stay connected to the latest RIDGID news by following RIDGID on Facebook, Twitter, Instagram and LinkedIn.